There were many positive responses to the lecture, one of which was an invitation to speak to one of the largest construction companies in the area, and another from a university. We would like to thank the organizers of the 2018 Knowledge Summit for having The Venus Project represented. Amazig news! TVP needs more of this kind of exposure and get the masses to know more about its proposals. You go Roxanne!! why does TVP not do an ICO, i think this project could resonate with many people, and plus, the project having its own currency could kickstart all of this into somehing tangible ? Amazing job Roxanne Meadows explains how there is truly a Better Way. We must focus on coming up with some amazing unique strategy to advertise TVP/RBE. Think about what are the most watched videos on YouTube. What is people follow the most? Clearly this is the result of what the current system has set to be the most interesting, so what could we do to make a viral video for TVP/RBE? What could we do to make it so known that it turns into global news and fashion? What could we do to make that happen? Clearly this will be something super challenging but it’s key. It’s challenging because it implies making something interesting which is not of interest for the current society (it’s something part of another society that collides with the current society’s views and understandings and conceptions). Anyways, a brilliant unprecedented advertising strategy is something so worthwhile to do. “We have one limited opportunity to spread the news about TVP/RBE and clearly the existence of our species depends on the implementation of it, so I suggest that we spend a good deal of our time determining the proper way to spread the news, for once we know the proper way, we could get it widely known, quite quickly and effectively”. NOTE: it does not mean that in the meantime we should be hidden letting the monetary system get away with its destruction. We can and must continue spreading news about TVP/RBE the current ways we know and according to the means we have available (the ones the monetary system does not keep us from having access to). Maybe asking some popular youtubers to make videos about TVP / RBE would help, and it’s something anyone can do, let’s do it ourselves (anyone who reads this comment), there are many channels that are constantly looking for topics to make videos about them so I’m pretty sure at least a few youtubers will like the idea and make a video about it. These types of speeches need to be shared, but I don’t find it easy to do so, social media will carry this if it’s more easily shared with the public. You and Jacque Fresco are a true inspiration to human kind, thank you for doing what you do. Great job Roxanne, I understand you shivering being in the lion’s hole of capitalism. Most these people need there material wealth to cover up their spiritual poverty. Technology is keeping them distracted from their inner unsecurity.external power symbols are needed for humans with non existant inner power. 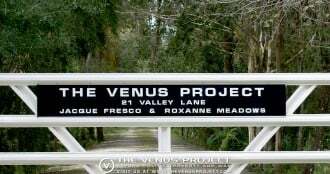 I love the venus project but find the technology part to cold. Would I want to live in such a city? I love the concept and know that the resource based sharing loving life style is the only way to go, but do enough other brothers and sisters want it also? I applaud your continuing effort towards a sustainable future that is resource based. The ideas of Jacque Fresco and your self are most logical path forward for our species. Dubai, es un lugar de millonarios…. lo van a ver como negocio, y no como algo ke ayude a la comunidad.. creo ke fue el peor lugar para la presentación del proyecto Venus. Muito bem Ms. Roxanne, você fala por todos nós, sinto um sentimento evolutivo e inovador de justiça social. We need to move together as a unified whole. As we cry about who, what, when? None of that matters. At the point of inception of thought or action we all think of the I, the what we can get from from this for ourselves. That is wrong we should be thinking at that inception, how can what I’m about to do benefit us ? Removing one’s own selfish desire and instead bringing up the people around you and making them prosper and happy will ultimately elevate oneself. The most important things that this direction needs from the world right now is energy and resources. In the world right now one of those resources is money. The solution? Thorium molten salt reactors (aka portable geothermal power) can supply not only essentially unlimited clean safe dense portable sustainable energy, but they can also produce rare isotopes for medical and space exploration applications. The process? Build a small Thorium molten salt reactor, use the energy to eliminate the research centers power bills, and sell the medial isotopes to help fight cancer and build the first city. Then build another Thorium molten salt reactor to power and provide for each individual section of the city. For these, alternate selling the rare medical isotopes and rare space exploration isotopes. The result would be each section of the city having redundant, abundant, clean energy and each section having redundant and abundant income. As the price of medical isotopes goes down then cancer treatments become more accessible and demand goes up, as the price of space exploration isotopes goes down exploring space becomes more accessible again increasing demand. This will keep the prices sustainable. Since the cities would have a large excess of clean sustainable available energy they could sell this excess energy to nearby cities in desperate need to get clean, as well as use the excess energy to create an excess of clean water and food, which again could be sold through automated processes to nearby cities and agricultural industries in desperate need. This business/energy model should be more than enough to independently sustain the cities, technologies, and people within the cities without the need for the people within the cities to have to pay for anything. As demand for access to these cities explodes so would the need for more of these cities pushing construction companies to follow suit and build more cities. As old cities empty then they would be more open to being recycled to help build new cities. This model should be sustainable enough to at least fund the transition and if the money runs out then by that time we’ll have so many completely and utterly free and self sustainable cities that it won’t matter anymore. Start with clean, safe, cheap, dense, portable, sustainable energy and everything else will fall in place. How do we do that? Thorium Molten Salt Reactors (aka Portable Geothermal Power). FYI, these things produce at least 3 different incredibly rare and incredibly valuable isotopes so sell those to kick off the first cities. Sorry to notice that someone like you uses this forum to spread their own believes. Please listen well to what Roxanne says and you will understand that money is not a resource. Thorium reactors are not yet available and are not at all clean energy! Solar, wind, geothermal and tide energy will get us far to start with. I congratulate Roxanne Meadows efforts to perpetuate Jacque Frescos ideas. I had the pleasure to speak to Jacque 10 years ago. Discussion the arquetectaul structures that he had designed and discuss the approch of matirials with a memory. All very fasinating. I clearly didn’t grasp the over all consept. Social sustainabilty and human evolution in these construct systems most definately has merit and common sense. We need to get done a real scaled community in place. I for one, applaud and sopport this movement for a better future for everyone. Congratulations for the amazing talk, Roxanne! This was an amazing opportunity to reach out to other folks around the world with this project. I am sure it will influence a few influencers to get involved. Great job Roxanne. Moving Forward is the comprehension The Venus Project when the education to understand that is about is a RBE and the team on the Venus Project make do. Roxanne Meadows we explaining about the free acess is the fundamental reason to create more abundance, the our necessity of lifes on the earth about change our values in this monetary system obsolete, because create scarcity and mental poor, diseases for profit , artifical necessities and desire done to the domain of the piscology that manipulate consumption perpetuate into the market for plubicities unnecessary and fooling. . Thank you very much Roxanne Meadows about the knowledge in our moving forward and following explaning on TVP ! TVP most go viral, we need cash for full advertising.